Stuttgart vacations take you to a storied and historic city in the heart of a large wine-growing region in Southwest Germany. With a heritage dating back to the Roman Empire, Stuttgart is dotted with castles and palaces, fine parks and gardens, and excellent museums. Book hotels in Stuttgart and pack your comfiest walking shoes—amid its urban landscape of hills and valleys, the city features more than 400 flights of steep steps. For families, one of the major attractions of Stuttgart is Wilhelma, once a royal palace and now a 74-acre zoo and botanical gardens. History buffs will want to see such landmarks as: the Old Castle, built in the 16th century; Ludwigsburg Palace, one of the largest Baroque palaces in Germany with equally expansive gardens; and Stiftskirche, or Collegiate Church, which dates back to the 12th century. Car enthusiasts won't want to miss the Porsche Museum and Mercedes-Benz Museum. Arrange car rentals in Stuttgart and pursue a driving tour of the vineyards around the city, or head to the Black Forest, about an hour's drive away. Stuttgart hosts some of the biggest, most vibrant annual festivals in all of Germany. Among them are the Cannstatter Volksfest, held over three weeks in late September and early October. It's a beer festival combined with a carnival, and its annual attendance reaches into the millions. The Stuttgart Spring Festival, usually held around late April, is the largest spring festival in Europe. Book Stuttgart vacation packages during the holiday season and you can shop at the city's traditional Christmas Market, one of the largest and oldest in Europe with more than 200 festively decorated stands. Find great deals on packages to Stuttgart here on Travelocity. Search among more than 400 airlines and 510,000 hotels worldwide—you're sure to get a price that fits your budget and a package that meets your all of your vacation desires. 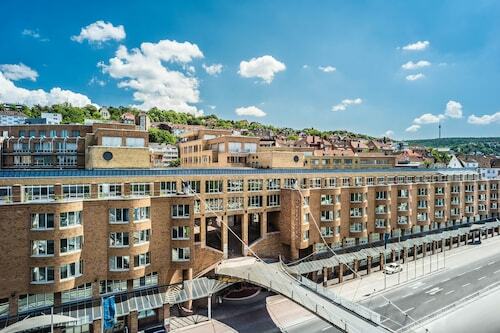 Located in the center of Stuttgart, this family-friendly hotel is within a 10-minute walk of Liederhalle Concert and Convention Center, University of Stuttgart, and St. Catherine's Hospital. Linden Museum and Friedrichsbau Vaudeville Theater are also within 15 minutes. Rosenberg-Seidenstrasse U-Bahn and Berliner Platz-Liederhalle U-Bahn are within a 5-minute walk. 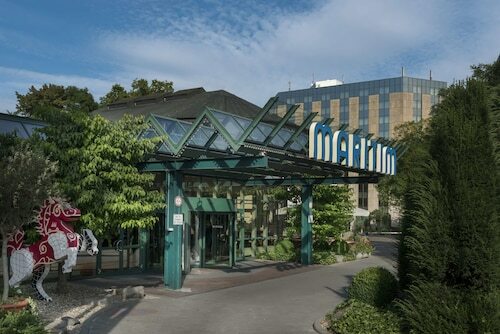 Located in Karlshöhe, this eco-friendly hotel is within a 15-minute walk of St. Marys Hospital (Marienhospital) and Konigstrasse. Market Hall and Milaneo are also within 3 mi (5 km). Marienplatz U-Bahn is only a 3-minute walk and Osterreichischer Platz U-Bahn is 9 minutes. Located in Rathaus, this hotel is within a 10-minute walk of Konigstrasse and Market Hall. Milaneo is 1.5 mi (2.5 km) away. Rotebuhlplatz Stadtmitte U-Bahn is only a 2-minute walk and Stuttgart Stadtmitte Station is 5 minutes. 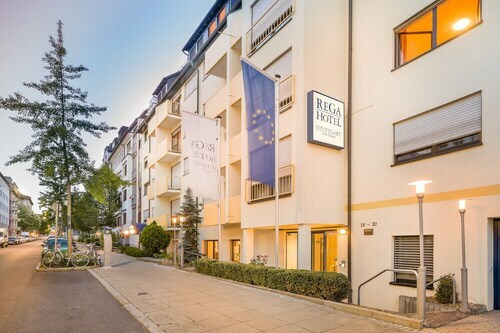 Located in Kernerviertel, this luxury hotel is within a 10-minute walk of Carl Zeiss Planetarium and Konigstrasse. Milaneo and Market Hall are also within 1 mi (2 km). Staatsgalerie U-Bahn and Neckartor U-Bahn are within a 5-minute walk. Located in Feuersee, this hotel is within a 10-minute walk of Liederhalle Concert and Convention Center and Konigstrasse. Market Hall and Milaneo are also within 2 mi (3 km). Schloss-Johannesstrasse U-Bahn and Stuttgart Feuersee S-Bahn are within a 5-minute walk. 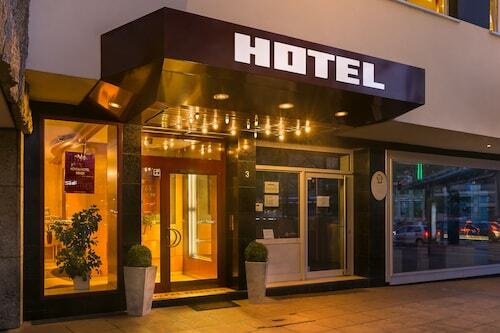 Located in Hauptbahnhof, this hotel is within a 15-minute walk of Konigstrasse, Market Hall, and Milaneo. Porsche Arena and Wilhelma Zoo are also within 3 mi (5 km). Stuttgart Central Station is only a 3-minute walk and Friedrichsbau U-Bahn is 5 minutes. 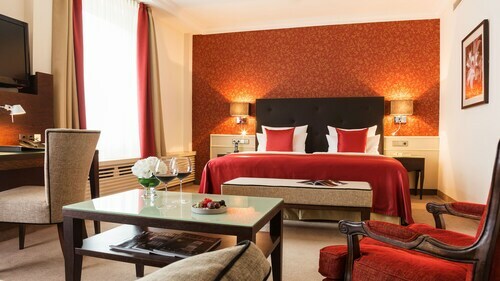 Located in Hauptbahnhof, this luxury hotel is within a 15-minute walk of State Gallery and Milaneo. Wilhelma Zoo and Porsche Arena are also within 3 mi (5 km). Stuttgart Central Station is only a 2-minute walk and Friedrichsbau U-Bahn is 6 minutes. This family-friendly Stuttgart hotel is located in a shopping district, within a 10-minute walk of Carl Zeiss Planetarium and Landtag. Old Castle (State Museum of Wurttemberg) and Weissenhof Museum are also within 2 mi (3 km). Stuttgart Central Station is only a 2-minute walk and Staatsgalerie U-Bahn is 5 minutes.